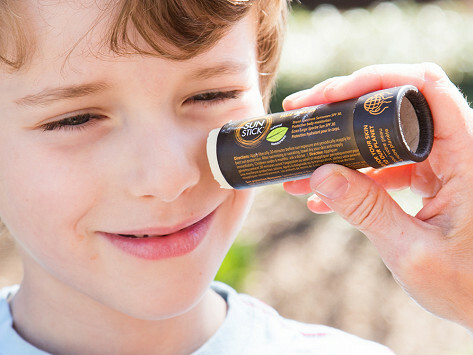 Stick it to harsh rays with this Made in the USA organic sunscreen that rolls right on. And this easy-to-apply formula contains only essential oils and other botanicals, but leaves out harmful chemicals, parabens, and phthalates. Enjoy fun in the sun without worrying about burns, or about what you’re putting on your skin. Product is safe to use and effective for up to 2 years beyond the best by date. Some products may show a best by date that has already passed. Dimensions: 1.25" x 1.25" x 3.75"
I have been hunting for something like this. It is everything I need. I use it daily, mostly for my face. Love it. It works great and with all natural ingredients. When an organic sunscreen, bug repellent, and moisturizing stick all feel and smell this good—and are earth and skin-friendly—there’s no need to reach for anything else. Dr. Fedorenko’s all-natural body goods are Made in the USA with essential oils, herbs, and other botanical elements. But what isn’t in there is just as important. You won’t find any additives, harsh chemicals, or anything synthetic blended in. Just natural goodness, like calendula, vitamin E, and coconut oil. Each comes in a handy stick for easy application, and the packaging is biodegradable, too. There are actually two doctors at work in this family company. Dr. Julia Fedorenko Bitton and her mom, Dr. Larissa Fedorenko, first created the Bug Stick to fight mosquitos and ticks at home in New York. They’ve since paired their backgrounds in dermatology and holistic medicine to helps bodies in other ways—and always naturally.